Home teeth whitening is easy, non invasive and cosmetic. It produces beautiful results for our patients. Our lab make designed patient trays to deliver a specially formulated and EU approved whitening gel to remove internal stains in the teeth. There are no long term negative effects on the enamel or strength of the teeth, on the dentine or the gums. This depends on a number of factors and results will vary between patients. Generally speaking, we will return your teeth to their brightest colour before all the staining (sometimes whiter). We will get your teeth as white as they will naturally go. We expect on average an improvement of 3-4 shades from treatment. We will take a shade of your teeth at the beginning of treatment and at the end to show the improvement in the appearance of your teeth. It may be case that you are happy with the result of the teeth whitening after a single use and you can happily stop if this is the case, most people on their first course of whitening see sustained improvement over a few sessions. Does it hurt to get teeth whitening? Most people will get some form of sensitivity from teeth whitening. It is usually mild and normally gone within 48 hours. By using the Sensodyne toothpaste in the trays for 1-2 hours will help reduce the sensitivity. No. The result of teeth whitening will vary from person to person based on lifestyle (e.g. staining foods or drinks – tea, coffee, red wine), wear of the teeth and the aging process of the teeth themselves. The real benefit of a home teeth whitening kit is that if you think the teeth have darkened over time or are not as bright as they were on completion of the treatment then, you have the ongoing ability to ‘top up’ or refresh the colour of your teeth from time to time. How often this is done will vary. Not at all! 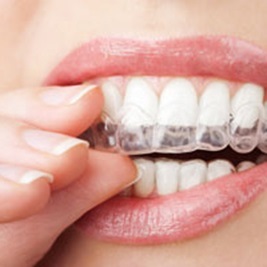 The kits provided need to used in accordance with the instructions provided and an assessment needs to be carried out in advance of the the provision of a teeth whitening kit, but following these simple precautions, teeth whitening is a safe and effective cosmetic dental procedure. Will the gel whiten crowns, veneers or false teeth? No, the gels will only work on natural dental tissue and not on dental restorations. This need not be a deterrent from teeth whitening! 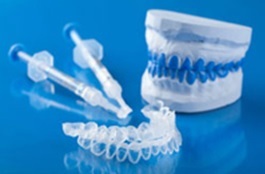 Teeth whitening procedures can be carried out following an assessment and if there are any discoloured dental restorations, then these can be replaced following teeth whitening. A treatment plan and cost will be provided prior to the teeth whitening procedure. Which systems does Mullane Dental use? At Mullane Dental we have searched the market for the most effective whitening system on the market and have been delighted with the 16% Perfecta tooth whitening system. It is a professional take home whitening system specifically formulated to remove tooth discolouration due to foods, tobacco and other stain-causing materials.